EURUSD is under the influence of some economic data such as Italian Quarterly Unemployment Rate, French Industrial Production m/m, French Gov Budget Balance, German Trade Balance, and German Final CPI m/m in Eurozone and Final Wholesale Inventories m/m in the US. 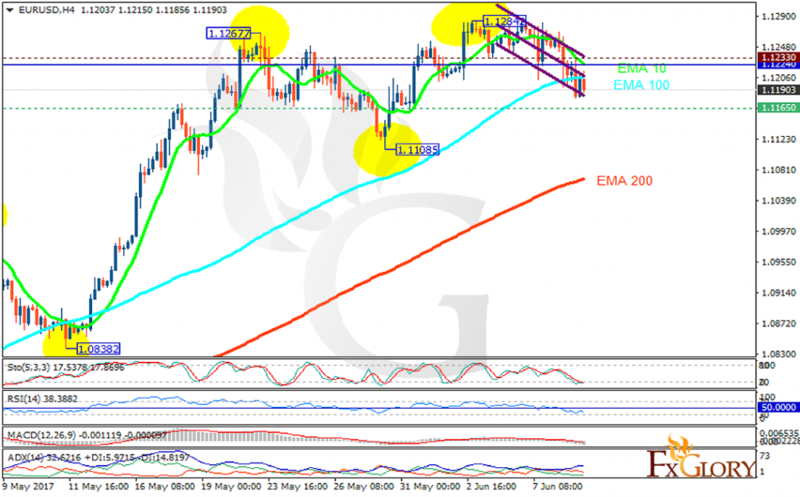 The support rests at 1.11650 with resistance at 1.12330 which the weekly pivot point at 1.12240 is located in between the lines. The EMA of 10 is moving with bearish bias along the descendant channel and it is above the EMA of 100 and the EMA of 200. The RSI is falling towards the oversold area, the Stochastic is showing downward momentum and the MACD indicator is in neutral territory. The ADX is not showing any clear signals. The support level breakthrough will push the pair downwards targeting 1.10.